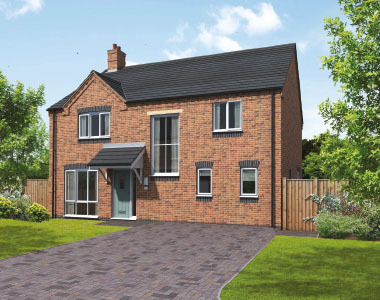 Twenty-four luxury three, four and five bedroom homes in the rural community of Rosliston, South Derbyshire, in the heart of the National Forest. Rosliston is a farming community, situated 2 miles south of Burton upon Trent, in South Derbyshire, and close to the villages of Walton on Trent and Coton in the Elms. The village was mentioned in Domesday as Redlauseton which was probably derived from Rodlauseton, an Ango-Saxon name meaning farm of Hrolf, a Norseman. Rosliston has always been a pleasant agricultural settlement. Its population in 1801 was 257, which rose to 360 by 1831. In 1991 it’s population stood at 543. In 1849, a school was opened by public subscription. The present school opened in 1846 with 44 pupils. Fees ranged from tuppence halfpenny to sixpence depending upon age and social class. In 1802 Rosliston and other neighbouring parishes were united for poor law purposes under the act of 1782. A workhouse was built in the village and in 1838 was run by a Mr John Campion and his daughter whose combined salary was over £36 per annum. The workhouse was sold to Joshua Hardy in 1840 for the sum of £200 and converted into tenements. These have long since been demolished and part of the Yew Tree estate now occupies the site. The manor belonged to Earl Algar, son of Earl Leofric and Countess (Lady) Godiva. In the Domesday Book the manor was called Redlauseton after it was taken by William the Conqueror,and it included a church and a mill. During World War II a prisoner of war camp was built near to the village to hold German and Italian prisoners. After the end of the war the camp was used to accommodate Polish servicemen. Rosliston is part of the National Forest. The site was bought by South Derbyshire District Council and Forest Enterprise with grant aid from the Countryside Commission. It is also in partnership with The National Forest Company. Information, educational and recreational facilities are provided for visitors, local residents and school groups. There are craft units, tea rooms, waymarked walks a wildlife hide and childrens play equipment. Just across the road from the Forestry Centre is Chapmans Nurseries, which stocks a wide range of bedding plants, cut flowers and pot plants. Just outside the village can be found the Beehive Farm Centre, which has a tack shop, falconry centre and craft units. Riding and fishing are also available and there is provision for disabled anglers. The Church of St Mary the Virgin was largely rebuilt and extended in 1819 but the C14 tower with its rebuilt broach spire still remains. The nave is a wide, aisleless structure with three large, two-light Gothic windows in each of its side walls, the middle one on the south wall having its lower half replaced by a porch. The shallow sanctuary, only slightly less wide than the nave, has the uniquely attractive feature of a triple chancel arch - a transverse arcade in which the central arch is just marginally larger than the two side ones. Save for the later Victorian furnishings the interior is quite unaltered and well worth a visit. 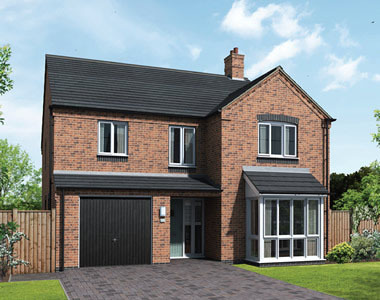 5 Bedroom Detached House, 2027 sq ft. Spacious detached family home with a large kitchen/diner/family area and separate living room, double garage, master bedroom with en suite and dressing room and second en-suite to bedroom 2. 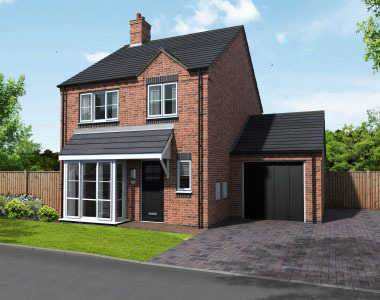 3 Bedroom house, 984 sq ft.
Kitchen/dining room, separate living room and en-suite to master bedroom. 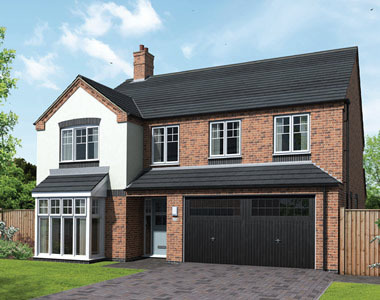 5 Bedroom Detached House, 1770 sq ft. 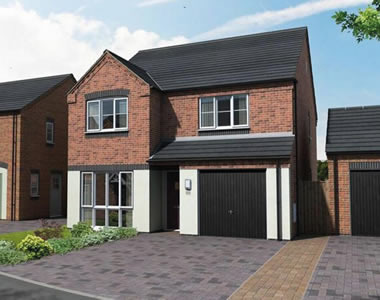 This 5-bedroom detached family home has a large kitchen/diner, separate living room and ensuite to the master bedroom.